Good reform is also possible in the medium run. Policy makers could implement a big bang version of tax reform, replacing the corrupt internal revenue code with a simple and fair flat tax. 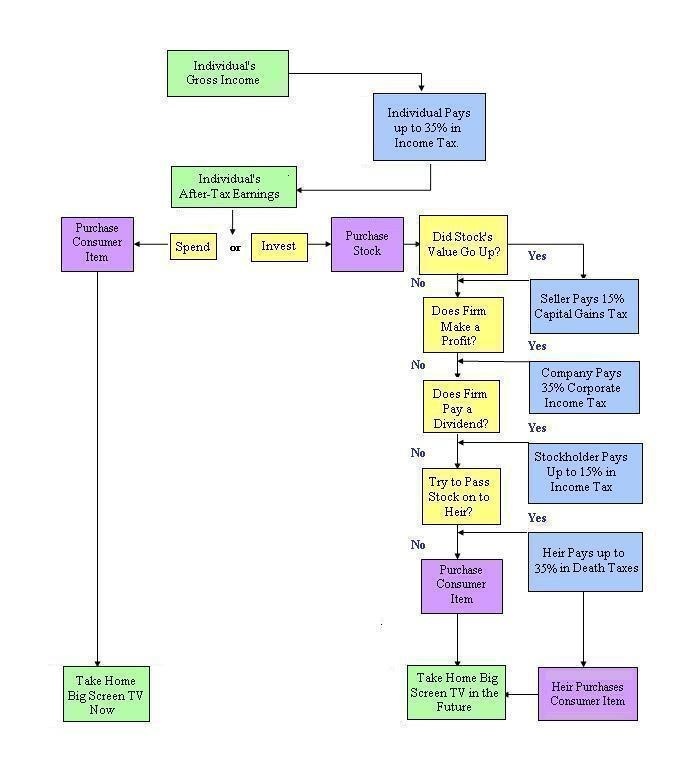 That automatically would eliminate the tax bias against saving and investment since one of the key principles of the flat tax is that income gets taxed only one time. That being said, there’s no chance of sweeping tax reform for the next few years (and maybe ever), so let’s look at some pro-growth incremental reforms that would reduce or eliminate the extra tax penalties on income that is saved and invested. On the investment side of the ledger, any policies that lower or end the capital gains tax and the double tax on dividends would be desirable. But let’s focus today on the saving side. And let’s start by explaining how a fair and neutral system would operate. Here’s what I wrote back in 2012 and I think it’s reasonably succinct and accurate. …all saving and investment should be treated the way we currently treat individual retirement accounts. If you have a traditional IRA (or “front-ended” IRA), you get a deduction for any money you put in a retirement account, but then you pay tax on the money – including any earnings – when the money is withdrawn. If you have a Roth IRA (or “back-ended” IRA), you pay tax on your income in the year that it is earned, but if you put the money in a retirement account, there is no additional tax on withdrawals or the subsequent earnings. From an economic perspective, front-ended IRAs and back-ended IRAs generate the same result. Income that is saved and invested is treated the same as income that is immediately consumed. From a present-value perspective, front-ended IRAs and back-ended IRAs produce the same outcome. All that changes is the point at which the government imposes the single layer of tax. The key takeaways are in the first and last sentences. All savings should be protected from double taxation, not just what you set aside for retirement. And that means government can tax you one time, either when you first earn the income or when you consume the income. Our friends to the north can teach us some lessons on this issue. Here are some excerpts from a column in the Wall Street Journal, authored by my colleague Chris Edwards and Amity Shlaes of the Calvin Coolidge Foundation. Some Republicans are advocating a giant child tax credit, but there are more effective means for helping the middle class. One is a tax program already road-tested in the country whose populace most resembles our own, Canada. It’s called the Tax-Free Savings Account and TFSA, as most Canadians refer to it, is a roaring success. …what is this Canadian savings account? The nearest U.S. equivalent would be Roth Individual Retirement Accounts. With a Roth, workers pay taxes on earnings before they put their cash into the account. The money then grows tax-protected, and people pay no tax when they withdraw it. But these accounts are much better than Roth IRAs. Though these savings accounts were introduced only five years ago, 48% of Canadians have already signed up. That compares with only 38% of U.S. households owning any type of IRA—though IRAs have been around for decades….Roth accounts have numerous restrictions. You can’t open a Roth easily if your earnings are above certain limits: $191,000, for example, for a married couple filing jointly. You can’t withdraw cash whenever you feel like it, at least not without daunting penalties. 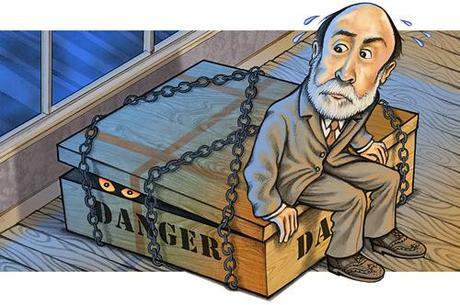 …Canada’s TFSAs are like Roth IRAs—but supercharged. Citizens may deposit up to $5,500 after-tax each year, and all account earnings and withdrawals are tax-free. However, unlike Roth IRAs, funds can be withdrawn at any time for any reason with no penalties or taxes. Another feature: The annual limit on a contribution carries over from year to year if a citizen doesn’t reach it. So if a Canadian contributes $2,000 this year, he can put away up to $9,000 next year ($3,500 plus $5,500). There are other attractive features: Unlike in a Roth, there are no income limits for individuals contributing to a TFSA, and there are no withdrawal requirements at retirement. In other words, the Canadian accounts are like unlimited or unrestricted Roth IRAs. And because the government isn’t trying to micro-manage how people save, Canadians are very receptive. Chris adds some additional information in a post for Cato at Liberty. 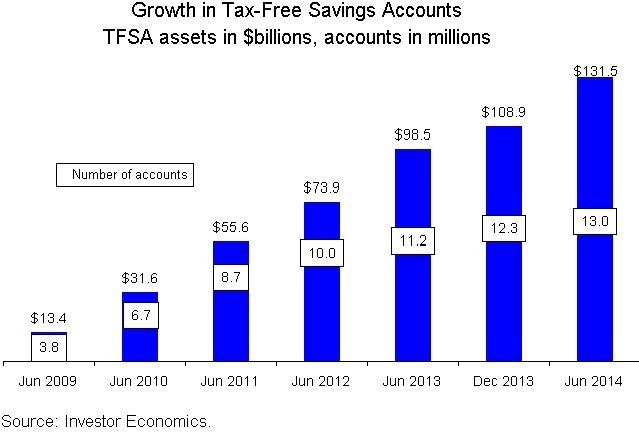 …released new data confirming the popularity of TFSAs. In just the past year, TFSA account assets increased 34 percent, and the number of accounts increased 16 percent. In June 2014, 13 million Canadians held $132 billion in TFSA assets. Given that the U.S. population is about 10 times that of Canada, it would be like 130 million Americans pouring $1.3 trillion into a new personal savings vehicle. …In just five years, TFSAs have become the most popular savings vehicle in Canada, outstripping the Canadian version of 401(k)s.
Here’s a chart Chris included in his blog post. And he adds some more analysis on the importance of simple vehicles to protect against double taxation. Everyone agrees that Americans don’t save enough, so why don’t we kick-start a home-grown savings revolution with a U.S. version of TFSAs? …Canada has now run the real-world experiment on such accounts, and it has succeeded brilliantly. TFSAs, or USAs, are a better way to handle savings in the tax code. Currently, many people are scared off by the complexity of U.S. savings vehicles and by the lack of liquidity in retirement accounts. TFSAs solve these problems. I guess we’ll have to wait and see whether American policy makers pay attention and follow Chris’ sage advice. P.P.S. I do like that Chris and Amity argued that the accounts would be better than big child tax credits, particularly since I also argued in the Wall Street Journal that there were better ways to help the middle class. P.P.P.S. Canada also can teach us important lessons on other issues, such as spending restraint, corporate tax reform, bank bailouts, and privatization of air traffic control. Heck, Canada even has one of the lowest levels of welfare spending among developed nations. P.P.P.P.S. No wonder the two most capitalistic places in North America are in Canada. And Canada ranks above the United States in the Economic Freedom of the World Index. P.P.P.P.P.S. Though there are still plenty of statists north of the border, so I’m not sure it’s the best escape option for advocates of small government. Though I doubt leftists no longer see it as an escape option, which was the premise of this joke that circulated after the 2010 election. As part of his State-of-the-Union speech, President Obama announced he was going to unilaterally create a new retirement savings account that supposedly would be available to all workers. Employers would be mandated to facilitate these”MyRA” accounts, and the money collected would be invested in “guaranteed” government bonds. There are some good features to the MyRA plan, most notably the fact that money in the accounts would be protected from double taxation. Workers would put after-tax money in the accounts, but there would be no additional layers of tax on any earnings, or when the money is withdrawn. In other words, a MyRA would be akin to a back-ended (or Roth) IRA. But there are some bad features, including the fact that taxpayers would be subsidizing the earnings, or interest, paid to account holders (though this would be a relatively benign form of government spending, at least compared to Obamacare, ethanol, etc, etc). My biggest complaints, though, are the sins of omission, which I discuss in this interview for Blaze TV. Simply stated, if Obama was concerned about low returns for savers, he should be directing his ire at the Federal Reserve, which has artificially pushed interest rates to very low levels as part of its easy-money policy. But more importantly, MyRAs will be very inadequate for most workers with modest incomes. If the President really wanted to help ordinary people save for retirement, he would follow the successful example of more than 30 other nations and allow workers to shift their payroll taxes into personal retirement accounts. This video explains why reform is so desirable. Critics say it would be very expensive to make a transition to this modern system, and they’re right. If we let younger workers put their payroll taxes in a personal accounts, we’ll have to come up with a new source of revenue to finance benefits being paid to current retirees and older workers. And we’re talking lots of money, as much as $7 trillion over the next few decades. But that’s a lot less than the $36 trillion cash shortfall that we’ll have to somehow deal with if we maintain the current system. In other words, we’re in a very deep hole. 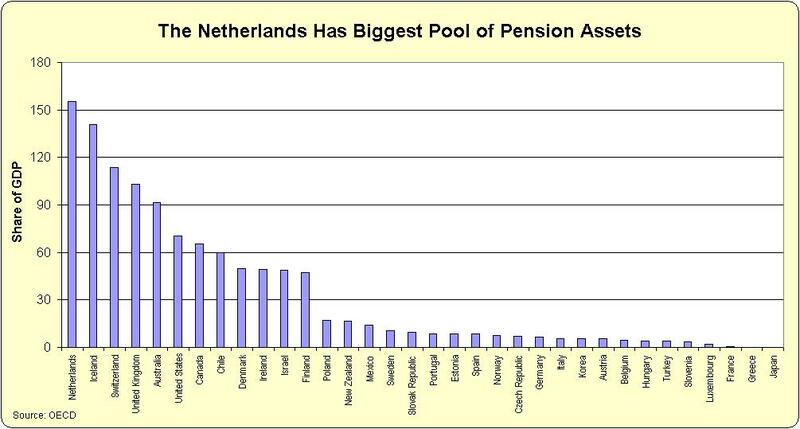 But if we shift to personal retirement accounts, the hole won’t be nearly as large. P.S. The video mentions that Chile and Australia deserve special attention. Click here if you want to learn about Chile’s successful system and click here if you want to see how Australia’s “superannuation” system has been a big winner. P.P.S. Some people already have asked me whether I was too Pollyannish in saying that there’s no risk for several decades that Washington will default. I could be wrong, of course, and I have shared BIS, OECD, and IMF data that reveals the United States has gigantic long-run fiscal challenges. But as I said in the interview, I think most other welfare states will collapse first, and that will lead to “flight capital” coming to America, which will help prop up our system. P.P.P.S. You can enjoy some Social Security cartoons here, here, and here. And we also have a Social Security joke if you appreciate dark humor. P.P.P.P.S. You probably don’t want to know how Obama would like to “fix” the Social Security shortfall. Back in the 1960s, Clint Eastwood starred in a movie entitled The Good, the Bad and the Ugly. I was thinking that might be a good title for today’s post about some new research by Michelle Harding, a tax economist for the OECD. But then I realized that her study on “Taxation of Dividend, Interest, and Capital Gain Income” doesn’t contain any “good” news. At least not if you want the United States to be more competitive and create more jobs. This is because the numbers show that the internal revenue code results in punitive double taxation of income that is saved and invested. 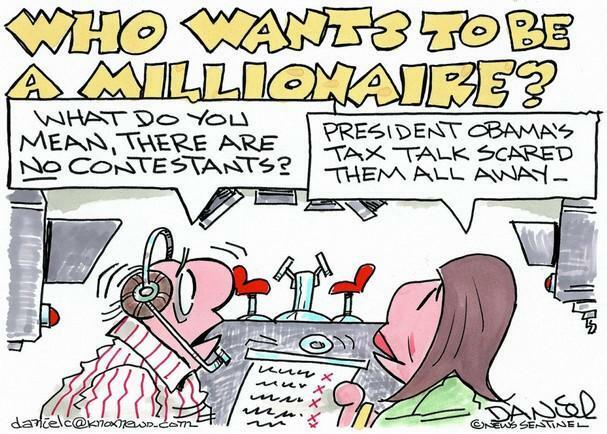 But it’s not newsworthy that there’s a lot of double taxation in America. What is shocking and discouraging, however, is finding out that our tax code is more punitive than just about every European welfare state. This is the “bad” part of today’s discussion. Indeed, the tax burden on dividends, interest, and capital gains in America is far above the average for other industrialized nations. Let’s look at some charts from the study, starting with the one comparing the tax burden on dividends. As you can see, the United States has the dubious honor of having the sixth-highest overall tax rate (combined burden of corporate and personal taxes) among developed nations. Though maybe we should feel lucky we’re not in France or Denmark. The next chart looks at the tax burden on capital gains. Once again, the United States has one of the most onerous tax systems among OECD countries, with only four other nations imposing a higher combined tax rate on capital gains. By the way, if you want to know why this is a very bad idea, click here. Last but not least, let’s look at the tax burden on interest. I’m sure you’ve already detected the pattern, but I’ll state the obvious that this is another example of the United States being on the wrong side of the graph. So the next time you hear somebody bloviating about Americans being too short-sighted and not saving enough, you may want to inform them that there’s not much incentive to save when the IRS gets a big share of any interest we earn. Not that any of us are getting much interest since the Fed’s easy-money policy has created an atmosphere of artificially low interest rates, but that’s a topic for another day. Let’s now move to the “ugly” part of the analysis. Some of you may have noticed that the charts replicated above are based on tax laws on July 1, 2012. Well, thanks to Obamacare and the fiscal cliff deal, the IRS began imposing higher tax rates on dividends, capital gains, and interest on January 1, 2013. And because of the new surtax on investments and the higher tax rates on dividends and capital gains, the United States will move even further in the wrong direction on the three charts. I don’t know if that means we’ll overtake France in the contest to have the most anti-competitive tax treatment of dividends and capital gains, but it’s definitely bad news. Oh, and let’s add another bit of “ugly” news to the discussion. The OECD study didn’t look at death tax rates, but a study by the American Council for Capital Formation shows that the United States also has one of the world’s most punitive death taxes. Even worse than France, Greece, and Venezuela, which is nothing to brag about. I don’t want to be the bearer of nothing but bad news, so let’s close with some “good” news. At least relatively speaking. It’s not part of the study, but it’s worth pointing out that the overall burden of taxation – measured as a share of GDP – is higher in most other nations. The absence of a value-added tax is probably the most important reason why the United States retains an advantage in this category. Needless to say, this is why we should fight to our last breath to make sure this European version of a national sales tax is never imposed in America. P.S. One of the big accounting firms, Ernst and Young, published some research last year that is very similar to the OECD’s data. Question of the Week: What Do I Think of the Baucus-Hatch “Blank Slate” Approach to Tax Reform? I’m a big proponent of tax reform, so at first I was very excited to learn that Senators Max Baucus (D-MT) and Orrin Hatch (R-UT) were launching an effort to clean up the tax code. But on closer inspection, I don’t think this will lead to a simple and fair system like the flat tax. Or even a national sales tax (assuming we could trust politicians not to pull a bait-and-switch, adding a new tax and never getting rid of the income tax). But judge for yourself. Here’s some of what’s contained in a letter they sent to their colleagues, starting with some language about the growing complexity of the tax code and the compliance cost for taxpayers. …since then, the economy has changed dramatically and Congress has made more than 15,000 changes to the tax code. The result is a tax base riddled with exclusions, deductions and credits. In addition, each year, it costs individuals and businesses more than $160 billion to comply with the tax code. The complexity, inefficiency and unfairness of the tax code are acting as a brake on our economy. We cannot afford to be complacent. Sounds good, though they also could have mentioned other indicators of nightmarish complexity, such as the number of pages in the tax code, the number of special tax provisions, or the number of pages in the 1040 instruction manual. I’m a bit mystified, however, at the low-ball estimate of $160 billion of compliance costs. As explained in this video, there are far higher estimates that are based on very sound methodology. But perhaps I’m nit-picking. Let’s see with Senators Baucus and Hatch want to do. I don’t like the term “tax expenditure” since it implies that the government taking money from person A and giving it to person B is equivalent to the government simply letting person B keep their own money. These two approaches may be economically equivalent in certain cases, but they’re not morally equivalent. Once again, however, I may be guilty of nit-picking. That being said, there is a feature of the “blank slate” approach which does generate legitimate angst. There’s a footnote in the letter that states that the Joint Committee on Taxation is in charge of determining so-called tax expenditures. A complete list of these special tax provisions as defined by the non-partisan Joint Committee on Taxation. This is very troubling. The JCT may be non-partisan, but it’s definitely not non-ideological. These are the bureaucrats, for instance, who assume that the revenue-maximizing tax rate is 100 percent! Moreover, the JCT uses the “Haig-Simons” tax system as a benchmark, which means they start with the assumption that there should be pervasive double taxation of income that is saved and invested. This is not nit-picking. The definition of “tax expenditure” is a critical policy decision, not something to be ceded to the other side before the debate even begins. As illustrated by this chart, the tax code is very biased against saving and investment. Between the capital gains tax, the corporate income tax, the double tax on dividends, and the death tax, it’s possible for a single dollar of income to be taxed as many as four different times. This is a very foolish policy, particularly since every school of thought in the economics profession agrees that capital formation is a key to long-run growth. Even the Marxists and socialists! To make matters worse, double taxation puts America at competitive disadvantage. To get a sense of how the U.S. tax system is a self-inflicted wound, check out these sobering international comparisons of death tax burdens and the degree of double taxation of dividends and capital gains. Here’s what the Haig-Simons tax base means. 1. An assumption that new business investment should be penalized with depreciation instead of being treated neutrally with expensing. 2. An assumption that IRAs and 401(k)s are loopholes to be eliminated, when they’re actually ways to protect against double taxation. 3. An assumption that various other forms of double taxation – such as the capital gains tax – should be retained. But that’s not the only preemptive capitulation to bad policy. The “blank slate” assumes that the class-warfare bias in the tax code also should be part of the benchmark against which possible reforms will be judged. …we asked the nonpartisan Joint Committee on Taxation and Finance Committee tax staff to estimate the relationship between tax expenditures and the current tax rates if the current level of progressivity is maintained. …The blank slate approach would allow significant deficit reduction or rate reduction, while maintaining the current level of progressivity. Since the internal revenue code already imposes a disproportionate burden on upper-income taxpayers – even when compared to European welfare states, it doesn’t make sense to automatically assume an ideological agenda such as progressivity. This has been a very long answer to a simple question, but it’s very important to realize that tax reform is a three-legged stool. If we want to minimize the economic damage of generating revenue for government, we should have 1) a low tax rate, 2) no distorting tax preferences, and 3) no distorting tax penalties such as double taxation. Unfortunately, too many people focus only on the first and second legs of the stool. And while tax rates and deductions are important, so is double taxation. I’m not asserting that the “blank slate” should have assumed no double taxation (sometimes referred to as the “Fisher-Ture” tax base or “consumption” tax base). But I don’t think it would have been unreasonable for Senators Baucus and Hatch to have told other Senators that one of their choices would be to pick either the Haig-Simons approach or the Fisher-Ture approach. Heck, even the Congressional Budget Office acknowledged that there are two ways of measuring tax expenditures. To reiterate, the choice of tax base should be a policy decision, not a built-in assumption. If the Government Doesn’t Double Tax Your Retirement Savings, Are You Benefitting from an Entitlement? I’m cited some remarkable examples of Orwellian language abuse. A German bureaucrat accused a Czech politician of “obstructing the democratic process” for blocking a treaty, even though voters weren’t allowed to vote on the treaty in 26 out of 27 EU nations. American politicians, including President Obama, deliberately cause confusion by referring to tax provisions as being forms of government spending. I prefer the honest approach. If you believe in bigger government and higher taxes, you should “man up” and openly express your views. Don’t dissemble, prevaricate, mislead, and obfuscate. The same is true, by the way, for advocates of individual freedom and smaller government. 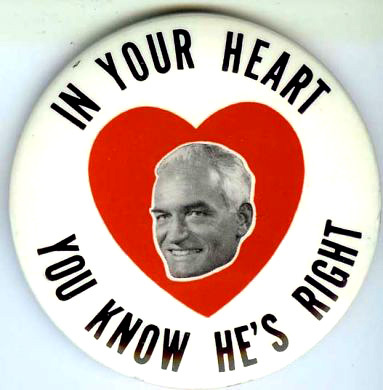 I’ve always admired Barry Goldwater, who famously wrote, “I have little interest in streamlining government or in making it more efficient, for I mean to reduce its size. I do not undertake to promote welfare, for I propose to extend freedom. My aim is not to pass laws, but to repeal them.” There’s no ambiguity in that statement! Anyhow, we have a new entry in this contest for the most egregious use of Orwellian word games. And, not surprisingly, it’s by a statist. Fred Hiatt, the editorial page editor of the Washington Post, wrote a column claiming that people are getting an entitlement if the government doesn’t double tax their retirement savings. This spring Obama proposed a cap of about $3.4 million on how much people can save in their tax-advantaged IRAs and 401(k) plans… Obama isn’t keeping people from saving as much money as they can or want. The question is how much the rest of us should have to chip in. Obama is suggesting that at some point retirement accounts, invented to encourage working people to set aside enough for their sunset years, no longer need a helping hand from taxpayers. …The entitlement culture…runs deeper than the entitlement programs we normally think of, like Medicare and Social Security. …Now it’s the top one-thousandth demanding their right to tax breaks for socking away unlimited wealth in retirement plans. There are several things about these excerpts that rub me the wrong way. First, IRAs and 401(k)s are not “tax advantaged.” They’re tax neutral. These vehicles exist so that people don’t get double taxed on their savings. As I explained last year. If you have a traditional IRA (or “front-ended” IRA), you get a deduction for any money you put in a retirement account, but then you pay tax on the money – including any earnings – when the money is withdrawn. If you have a Roth IRA (or “back-ended” IRA), you pay tax on your income in the year that it is earned, but if you put the money in a retirement account, there is no additional tax on withdrawals or the subsequent earnings. From an economic perspective, front-ended IRAs and back-ended IRAs generate the same result. Income that is saved and invested is treated the same as income that is immediately consumed. This is statist nonsense. If somebody has an IRA and 401(k), they’re saving their own money. There’s no obligation being imposed on me or any other taxpayer. But Hiatt presumably thinks that the government’s decision not to impose double taxation is somehow akin to a giveaway. But that only makes sense if you assume that government has a preemptive claim to all private income. In other words, Hiatt wants us the think that there’s no moral, ethical, or economic difference between giving person A $5,000 of other people’s money and person B being allowed to keep $5,000 of his or her own money. But if that’s true, why bother producing and subjecting yourself to stress when your reward is punitive tax rates? Why not participate in the easy side of the “entitlement culture” and simply take other people’s money? In the real world, of course, that leads to policies with ever-growing numbers of people choosing to ride in the wagon and fewer and fewer people pulling the wagon.